As per Persistence Market Research, the global life science products market was estimated to be valued at more than US$ 2,500 Mn in 2015 and is projected to grow to approximately US$ 4,200 Mn by 2024 end. This represents a CAGR of 4.3% over the forecast period. The global market for life science products represents absolute $ opportunity of nearly US$ 120 Mn in 2017 over 2016 and incremental opportunity of approximately US$ 1,500 Mn between 2016 and 2024. 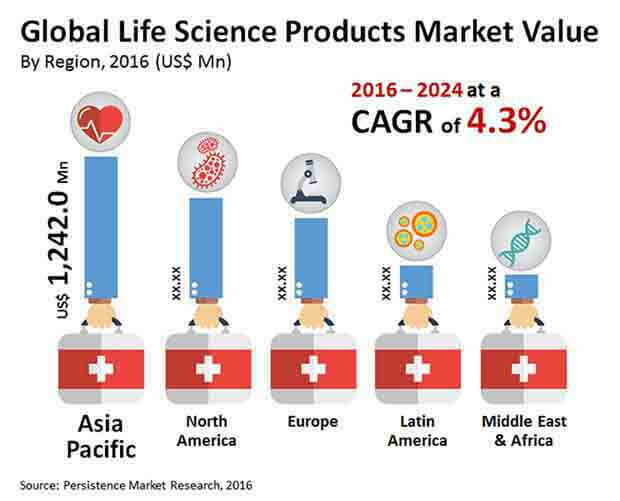 The global value of the life science products market is expected to grow 1.4x by 2024 end as compared to that in 2016, primarily due to investments in R&D in the life sciences domain and demand for high quality products and tools for research. There has been a shift in investments in R&D and technology, especially in the life sciences domain, from North America and Europe to Asia Pacific. Developing economies such as India have ample skilled labor and qualified manpower at affordable costs thereby increasing the scope for attracting outsourcing of biotech projects. Additionally, several governments in the Asia Pacific region have started taking initiatives to support growth of the domestic biotechnology industry by offering tax exemptions on R&D initiatives; increasing budgets and funding, creating public and private conglomerates; and attracting foreign direct investments. Over the past few years, Taiwan’s drug regulatory agency has built a relationship with China, establishing protocols for reciprocal acceptance of clinical trials, leading to several companies investing in programs in these regions. The fifth Science and Technology Basic Plan was adopted in Japan at the end of 2015 and the ‘Grants-in-Aid for Scientific Research’ government funding remained flat for the fiscal year starting April 2016.